↑ ୧.୦ ୧.୧ ୧.୨ ୧.୩ ୧.୪ ୧.୫ "Bleomycin Sulfate". The American Society of Health-System Pharmacists. Retrieved Aug 1, 2015. ↑ Shaw, P; Agarwal, R (2004). "Pleurodesis for malignant pleural effusions". The Cochrane database of systematic reviews (1): CD002916. PMID 14973997. ↑ Sneader, Walter (2005). Drug discovery : a history (Rev. and updated ed.). Chichester: Wiley. p. 312. ISBN 9780471899792. 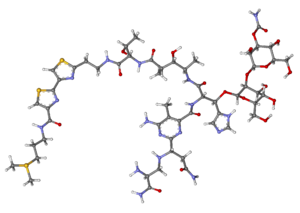 ↑ "Bleomycin". International Drug Price Indicator Guide. Retrieved 26 August 2015.